Thanks to John Harris of Durban SA for sending us this story and photographs. Well, we are back from the valley after a memorable hunt. 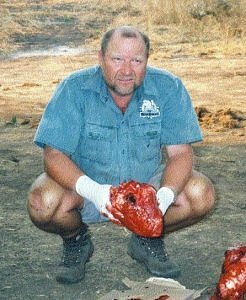 I was hunting in the Makuti/Marangora area of Zimbabwe. 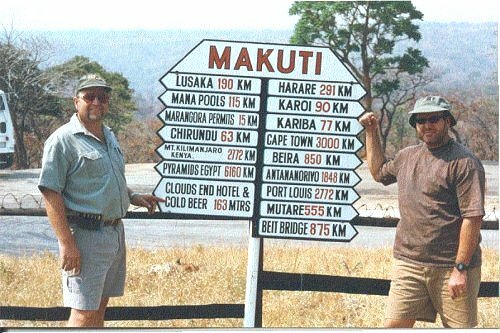 This is in the north western side of the country on the edge of the Zambezi valley escarpment, about 65 km from the Zambian border. The terrain is hilly, pretty rocky and vegetation is relatively dense with general visibility around 40-60m, but some places less than 5m. 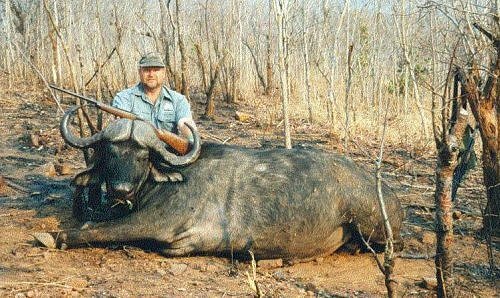 I shot my bull on the second day of the safari. We spotted a herd of around 60 animals the first day, crossing a ridge 2 hills away, with the wind blowing strongly towards them. After a 3 to 4 km brisk walk we were able to approach from the downwind side, only to find the herd had vanished. After a few hours of tracking we finally caught up with them, and snuck up through the long grass and bush to about 30m. They were resting in the shade and were too bunched up to get a decent view or shot. After a while they became uneasy and moved off into an even more difficult position. By this time I had no skin left on my knees from crawling around through the bush! Eventually they stormed off, and the tracking started again. We caught up to the herd about 2 hours later, and this time they were spread out grazing and we could look them over properly. There was not a single shootable bull, all that creeping, crawling etc for nothing. The two herd bulls present both had one broken horn...must have been a tough mating season?? Back to camp for a well earned cold beer, we must have walked close to 25km the first day. The following morning we hunted the Marangora side of the concession, and we saw a small herd of 3 bulls, a cow and calf and a young bull (about 18 months old) on a hill about 2km away. The prevailing wind ensured we had a long walk to get on the leeward side of the herd again. This time we had a successful stalk, and the biggest bull obliged after a bit of patience and walked up the ridge angling away from us. As he stopped for a moment to look back, I stepped out from behind the bush I was hiding behind, and drilled him. The bullet went in behind the ribs on the right hand side, through the rumen, spleen, liver and right through the centre of the heart, before exiting the far shoulder. The penetration was awesome! The bull hunched at the bullet strike, and ran with his head down over the ridge with the others. The reactionary hunch and head down run are sure indicators of heart shots on most game animals. A few seconds later we heard the bellow and knew the bull was down. We followed the trail over the ridge and found him down and dead about 65 yards from where he was shot. Interestingly, the young bull which was the same one we had seen abandoned by the herd the day before, was between us and the dead bull. This youngster had been injured on it's forehead and was obviously in pain and pretty weak, and was definitely hyena bait looking for a place to happen. The injury was about the size of my fist, and the birds were having a go at it and it was full of maggots, so the poor critter was not a happy camper. Anyway, as we skirted past it, it had the temerity to charge us, so we put it out of it's misery. Don, my co-hunter put a 404 through it's ribs and I stopped it with a 500 between the eyes. We proceeded to recover my bull, leaving the other animal to the scavengers as per hunting concession policy. 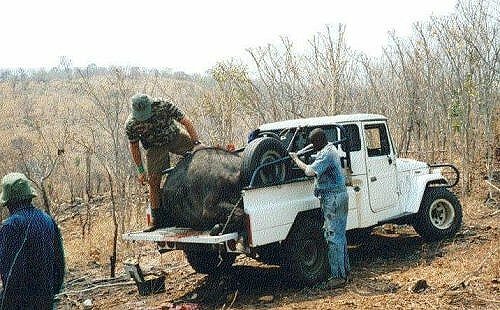 Four and a half hours later, and just a small amount of sweat, accompanied by the odd word like "gosh" and "bother" we had the animal loaded onto the Landcruiser, but that was after we had cut a road to the recovery spot. A cold beer, and later that evening a "heroic tot" of Glenfiddich whisky and a good Cuban cigar served to acknowledge a successful hunt and noble quarry. I used my Custom Ruger Single shot rifle in 500 Nitro Express. I shoot a 540gr GS Custom FN Solid at 2200 fps, and as indicated, the penetration is awesome, so extreme care has to be exercised when hunting that there are no other animals behind the target. The bullet did not deviate from the line of flight in its passage through the bull and the wound channel was substantial. The standard load for the 500 NE is 570 gr at 2100 fps but with the HV technology on the shank of GS Custom FN bullets at 2200 fps, there is no problem with pressure. The next few days were spent working the meat in camp, and relaxing with a bit of vermin shooting. If you are looking for me next year about this time, guess where I will be! !